MOTHER LOAF Mama Mel's founder Melissa Wenzel would love to be your neighborhood baker. Stop the presses and hold the wheat—there's a new bakery in Petaluma. And it's a dedicated gluten-free, community-supported bakery (CSB). Mama Mel's, the fruit of a seven-years-long labor, "all started with a baguette pan," says founder Melissa Wenzel. Wenzel always suspected she was gluten-intolerant, and baked quick breads for personal consumption for years—but it was the pan that inspired her to make artisan bread without wheat. Wenzel has a background in art and naturopathic medicine, and unsurprisingly approaches her gluten-free baking as both an art and science. She insists she's still perfecting her product, and came by her recipes through extensive research on different gluten-free flours and blends—"and a lot of trial and error," she says. Wenzel has tried various combinations of sorghum, brown rice, millet, tapioca, potato and flax seed flours, and angles for veganity in as many breads as possible by not adding eggs or milk. Store-bought gluten-free bread often lacks structural integrity or flavor, but Wenzel demonstrates that gluten-free bread and bagels don't have to be like that. Mama Mel's bread is delicious—it rivals any and all glutenous counter-loaves. "I treat it like regular bread," says Wenzell. She doesn't knead the dough, given the absence of gluten in it, but says the consistency changes after being handled. All Wenzel's bread is then cold-fermented for at least 24 hours, which breaks down some of the starches and helps give the bread its remarkable consistency. As Wenzel honed her talent for baking, friends clamored for her lovely loaves and asked to be on her "bread list." About a year ago, she opened this service up to the public and now operates Mama Mel's much like a CSA (community supported agriculture): customers sign up to receive the bread bimonthly or monthly, and pick it up at one of the local cafes that carry her products. Community supported bakeries rely on sustained community support, and in order to flourish, embrace direct relationships between purveyors and consumers. Wenzel says the model works well since she is able to butter people up with her bread without a corporate investor—as long as her customers remember to pick up their orders. "It's rustic, and in that way, simple," she says, citing the ease and informality of the CSB business model. 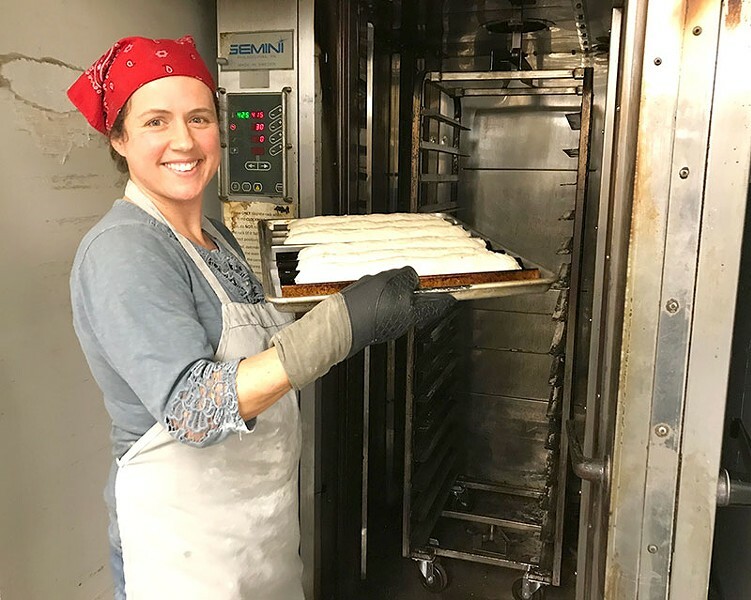 Though Mama Mel's, which consists of Wenzel, her husband and one employee, takes between 75 and 100 individual orders per month, Wenzel dreams of running a breadmobile—a bakery-like food truck—or opening a brick-and-mortar storefront. For now, she remains hard at work finalizing her flour mixes, and aims to teach others how to go gluten-free. "I would love to be the neighborhood gluten-free baker." Mama Mel's bread and bagels (and, hopefully soon, the croissant recipe Wenzel's working on) are available at Retrograde Coffee in Sebastopol, Brew Coffee & Beer House in Santa Rosa and, in Petaluma, Sarah's Eats & Sweets, Bump City Bakery and the Petaluma Farmers Market.